Andy: This was delicous. I could pour this over some ice cream for a nice tropical twist. Very smooth with a wonderful aroma and a authentic coconut taste. Is the perfect choice when you are looking for a true coconut taste. It’s a little hard to find compared to Parrot Bay, Malibu or Cruzan, but well worth the hunt. You won’t be disappointed! Adrian: Really nice aroma and tastes awesome straight. It really rivals my previous coconut favorite, Beachcomber. It tastes like I am in Caribbean heaven. 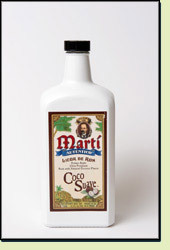 Without a doubt, a really good choice with a great coconut flavor especially at over 80 proof, and a bargain price to boot!